Before closing its doors on the Southbank, what better way to go out in style and attitude than with a blowout dedicated to 40 years of Punk culture in London. Weekend Punk celebrated the undefinable but unmistakable spirit of punk and its lasting influence on design and society. Free workshops, live performances and displays for potential, current and former punks of all ages showed that limited resources and a rebellious attitude are all that’s needed to create flyers, posters, fanzines, fashion and make an indelible impact on the world. The hand-on activities included a digital hacking workshop, Anarchy Punk Illustration the weekend Zine, creating jewellery with attitude and the weekend punk piñata. Final event on closing Sunday was Hands on Punk, a hands-on workshop on the theme of DIY graphics – create collages, posters and typographic layouts with simple tools and techniques on the working theme of Love and Hate. 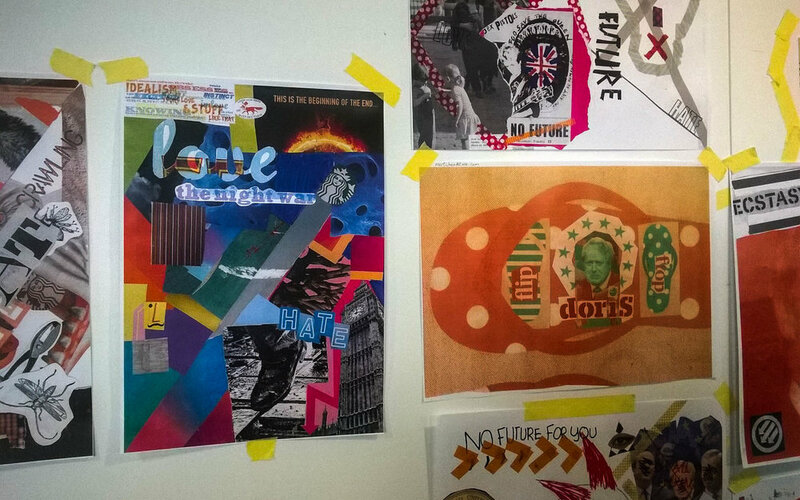 Participants had the chance to gain insight into the fundamental principles of punk art and design and the longstanding heritage of home-made, do-it-yourself visual communication, which given the EU-Referendum results that had come in only a couple of days earlier, turned for many into a cathartic experience, creating a visual commentary created to last.